The Parrot Specchio incorporates an Innovision NFC tag, allowing photographs to be transferred quickly and easily from an NFC phone directly to the digital frame. The new Parrot Specchio, designed by contemporary French artist Martin Szekely, comes with a built in Topaz NFC tag from Innovision Research & Technology that lets consumers with an NFC handset transfer photographs simply by touching the frame with their phone and without any need to go through the typical Bluetooth pairing process. 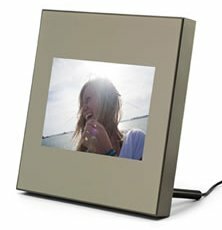 Built into the front of the frame, the Topaz tag enables an instant connection between mobile phone and photo frame, removing the need to go through menus and settings. The US$499 designer frame incorporates a range of upmarket functions and can also be used for transferring and displaying all sorts of visual information such as recipes, to-do lists, children’s drawings or anything that people want to share. Innovision’s Topaz tag is also built into Parrot’s Party Black Edition bluetooth speakers, launched in April.